^ Sachidananda Murthy (December 27, 2015). "And the next President is..." english.manoramaonline.com/home.html. Manorama Online. Retrieved 28 April 2016. ^ "Pranab Mukherjee describes RSS founder Hedgewar as 'great son of Mother India' - Times of India". The Times of India. Retrieved 2018-08-14. 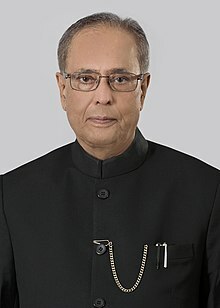 ^ a b c d e f g h i j k "Shri Pranab Mukherjee". Government of India. Archived from the original on 2011-05-14. Retrieved 11 July 2012. ^ Balaji, J. (21 December 2011). "Prime Minister Manmohan Singh presents The Best Administrator in India Award 2011 of the K. Karunakaran Foundation to Finance Minister Pranab Mukherjee". The Hindu. Chennai, India. Retrieved 2017-01-28. ^ India, Press Trust of (2017-12-25). "Pranab advocates free thinking among students". The Hindu. ISSN 0971-751X. Retrieved 2018-07-25. ^ "Pranab Mukherjee advocates free thinking among students at Jadavpur University". The New Indian Express. Retrieved 2018-07-25. ^ "CU confers D. Litt degree on Pranab Mukherjee". The Daily Star. 2018-01-16. Retrieved 2018-07-25.